So where did your feet take you this summer? It took me literally everywhere. First week of my summer vacation was spent in Coron where I did some bonding with nature. After that, I was out and about doing fun stuffs and meeting new people. It was a super great one that when I had to go back to work, I was in a depress depressan mode. But I guess work has its way jerking you from your cloud nine. I did fell from mine with a big thud first day of work after the vacay. Now, I have gone to accept that my summer is now but a fleeting memory and I have ten months of work ahead of me before I can be reunited again with the sun, sand, sea and the whole summer shebang. So now, I am finally bidding summer adieu with this random giveaway. 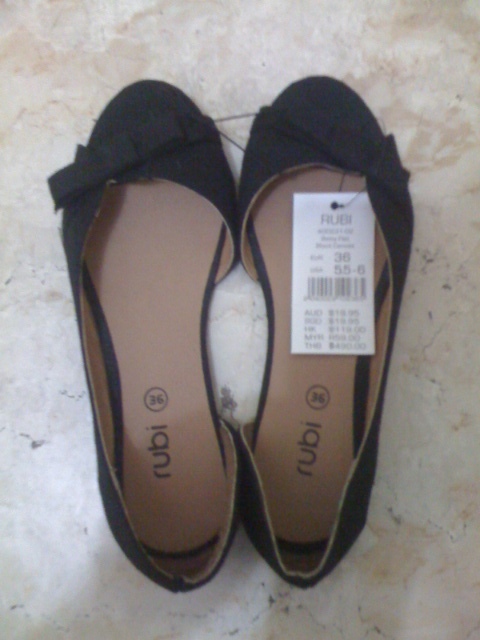 For this one I am giving away a pair of Rubi shoes from Singapore size 36. You can still join even if you’re not size 36 so long as you have somebody in mind (who’s size 36) that you want to give this pair to. This is your chance to make someone happy! It could be your mom, sister, aunt, or friend. Here’s the mechanics: Simply answer this question, “Where did your feet take you this summer?”. Leave your answer on the comment section of this post together with your facebook name and twitter name, city, and email add. Oh by the way, you have to be a fan of Blancnotes on facebook and a follower of @blancnotes in twitter for your entry to be valid. I will also be raffling a surprise gift to those who will share this post on their facebook wall with the line “Blancnotes is giving away a pair of Rubi shoes. Join now! Giveaway ends on May 31.”. Just leave the URL of your post together with the other deets. Dont forget to tag Blancnotes too. Easy peasy right?! My feet took me to the wide open beach of Hondagua, Quezon. My feet took me in zambales where I enjoyed the most, that’s why I cant blame my feet…hehehe. I’m with my family and of course you know….with my cute boyfriend! should I say handsome? Humble! We went to beaches and inhaling the fresh air while waiting for the sun to set.My feet never get tired of exploring the beauty of zambales coz its really more fun in the philippines! Virgin Beach, Laiya, Batangas is where my feet took me this summer! My feet take me to Mall Hopping this summer! My feet took me to go on Batangas Beach Resort with my family.I want to enjoy the summer with them. My feet took me this summer to Bicol! I love bicol, i love Bacacay, Bicol. The house of my uncle is near the ocean so every morning, me and my cousin would go there and swim! It has a black sand. We tour around the town, went near to Mt. Mayon and visit our relatives there! My feet took me to my hometown, Zambales. I miss all about it, the food, the place, the cool and clean air, the crystal beach of La Paz and of course, my family and friends. My feet took me to my hometown Queen City of the South Cebu City. We spent our summer vacation there with my husband and son. My feet took me to Coron, Palawan this summer. We spent our summer vacation there with my mom and dad. It’s the wonderful destination for island hopping and strolling in the beach. Specially, when I go out. My feet took me to this cozy family resort in a Sitio in Subic town in Zambales, me and the family took an overnight stay. It was a lot of fun with food , sun, water and super fun with the family. Where did your feet take you this summer? My feet took me to a serene place where the mountains and seas meet–Marinduque. They brought me to the amusing Moriones Festival, Greek-like Bellarocca Island, and the mystical Bathala Cave. My feet took me to Bicol province where we visited our grandparents(mother side). One of the memorable experienced in the farm! New fathers regularly take on senior posts, but most mothers who run big companies waited to take on CEO roles until their 40s or 50s, when their children were older. The key to making this work for both family and Yahoo, according to some of these mothers: a phalanx of nannies, a solid leadership team and a husband ready to shoulder more of the hands-on parental duties. Awesome shoes. I wants this. Price….? ?